Valentine’s Day is often associated with significant others and intimate date nights, but Valentine’s Day can be a day for celebrating all kinds of love. Show your children how much you love them by sharing the gift of reading with them, especially when a love of reading can lead to a lifelong love of learning. One of the best ways to get kids to read is by example. Whatever you do, your kids will want to try, too, therefore as a parent you can set an example in many ways. Let them see you read, whether it be a book or the newspaper. You can also keep books around the house as well. Even materials like magazines, reference books, and even coffee table tomes can help set a precedent – it shows kids that reading is a part of life and it has a place in the home. But another great way to encourage kids to read is to give them some books of their own. This Valentine’s Day, spread the love with titles that explore what it’s like to care for one another. There are plenty of classic stories about love, friendship and family. We have some titles that are perfect for this time such as “God’s Special Gifts to Me” and “God Loves Me” that can help kids feel accepted, reminding them that they have a place and purpose in the world. These personalized books make the sentiment all the more personal, and that special feeling can last a lifetime. “God’s Special Gifts to Me” can help remind kids that we are all God’s children and that He made us and loves us. This personalized story book can act as a reminder of the many blessings we experience every day and that there is always plenty to be thankful for. “God Loves Me” reminds kids that whether they feel frightened or sad, thankful or glad, that they can talk to God about it through prayer so they never feel alone and are loved. 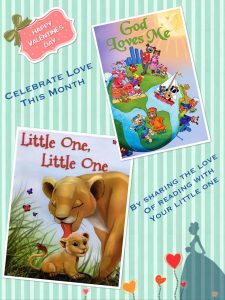 We also have other titles that appeal to many interests (such as your classic couple love stories) such as the Disney Princesses books, Aladdin, Pocahontas so there is sure to be a perfect book out there for your little one. 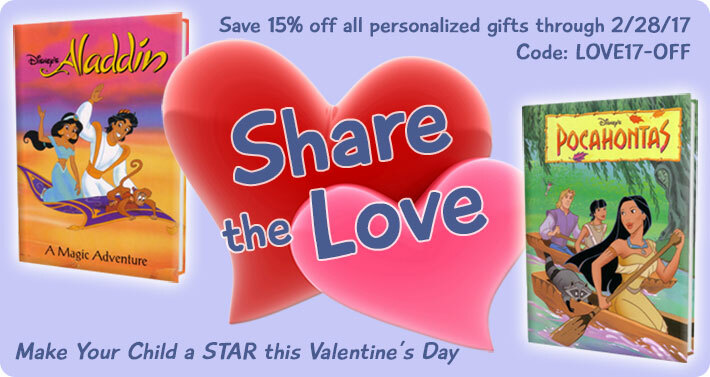 In celebration of Valentine’s Day, we are offering a 15% off discount to help you give the gift of love and reading. Use coupon code LOVE17-OFF expiring February 28, 2017.